Making some progress on my Jan Stawasz project. I started on the first round of split rings... then realised I had attached my last medallion the wrong way up! I'm now remaking the medallion before I can proceed and finish the split ring round. I'm slightly regretting my choice of thread at the moment... not the colour but the thread itself. It's DMC Babylo, a thread I normally enjoy using but not this time. I'm finding it hard to make my rings and chains really even and I now wish I'd used a thread with more body like Lizbeth. It's going to be a nice large piece as it already measures 12in across. Ah, it IS the green one I had imagined... This is beautiful and your tatting is impeccable, as always. Love it. I might just have to attempt this one next... Which book? 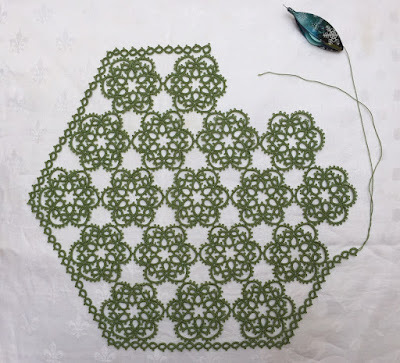 12 inches is a lot of intricate beautiful tatting, each medallion must be quite small.? It is a lovely green, your split rings look good to me.